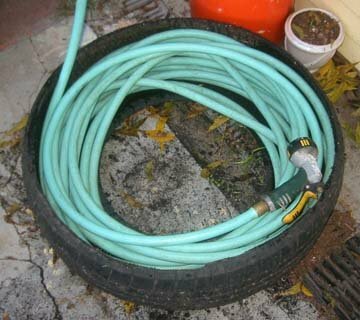 Here’s a cheap and easy way, using one of our favorite junk building materials–used tires, to keep that hose from trippin’ you up in the back yard. 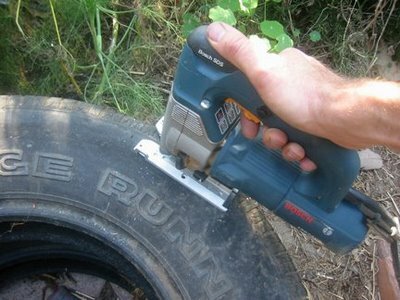 Cut out the sidewall of one side of a tire using a sabre saw. You could use a sharp knife, but electricity makes this task a lot easier. You’ll end up with the half cut out tire you see above. But your work is not yet complete. 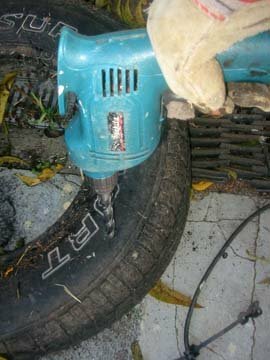 Drill a bunch of drainage holes in the bottom of the tire, at least one hole every three inches. This is to keep water from pooling when it rains. Incidentally, used tires combined with water make the perfect breeding ground for mosquitoes (more on the tragic global consequences caused by mosquitoes incubating in tires here). With a bunch of drainage holes you won’t have a problem. Got more used tires? 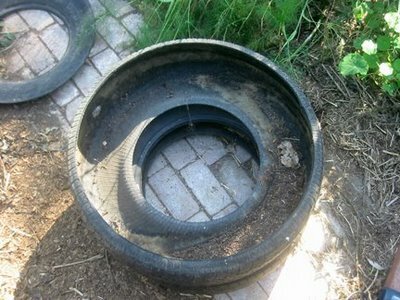 See our used tire composter here. That is brilliant! Thanks for passing this great idea on! This is a great blog, I would like to read it more often. You have great ideas, but I can’t see them very well with the black background. Think you could change it for the sight challenged? Used tires can be obtain free from any tire dealer. They are glad to get rid of them because otherwise they have to pay $1 each to the landfill to dump them. I am trying to cut up a tire right now, but I can’t seem to find the right kind of blade. What kind works best?